"There are 3 drives on my disk, including C, E and F, but I have very less space left in my C drive. How would I join C and E so that I can extend C"
Well, how can we merge partitions in Windows 7, Windows 8, Windows 10, or other Windows OS? This post will show you detailed steps. There are 2 utilities available to combine partitions for Windows users: one is Windows Disk Management, and the other is MiniTool Partition Wizard. Well, which utility should users choose? 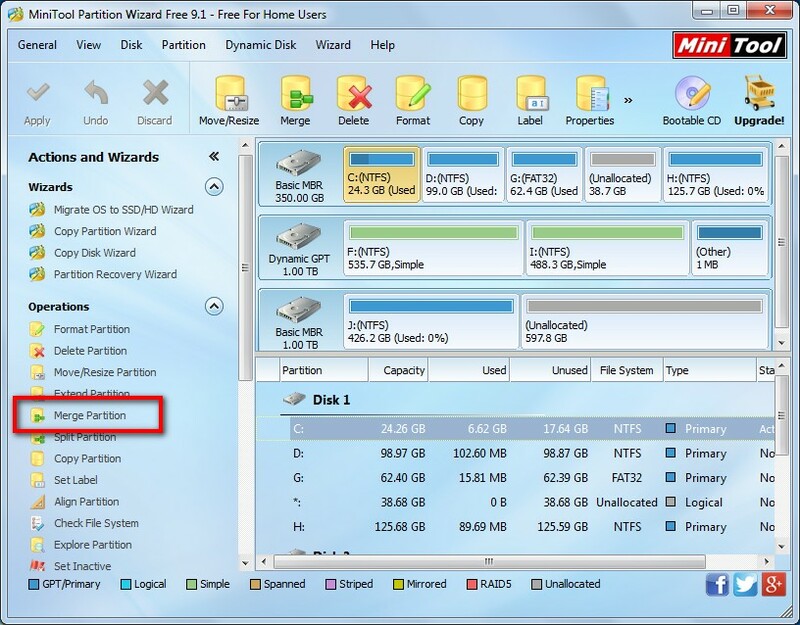 If partitions you want to combine are neighboring, both Disk Management and Partition Wizard are available. But if the partition hat will be included saves important files, you’d better employ MiniTool Partition Wizard, because Disk Management requires deleting the partition. However, if the 2 partitions are not adjacent, we highly suggest using MiniTool Partition Wizard, because this program will keep your data intact. Then, let’s see detailed steps to combine 2 partitions in Windows. Please delete the partition you don’t want to reserve via the right-click function "Delete Volume", and then enlarge the one you want to keep using the "Extend Volume" feature. If the Extend Volume feature cannot be chosen, please view the post Extend Volume Grayed out to get solutions. This program offers 2 functions to help you merge partitions, including Extend Partition and Merge Partition. If partitions you want to combine are continuous, Merge Partition is recommended. If they are non-adjacent, Extend Partition is the best choice. 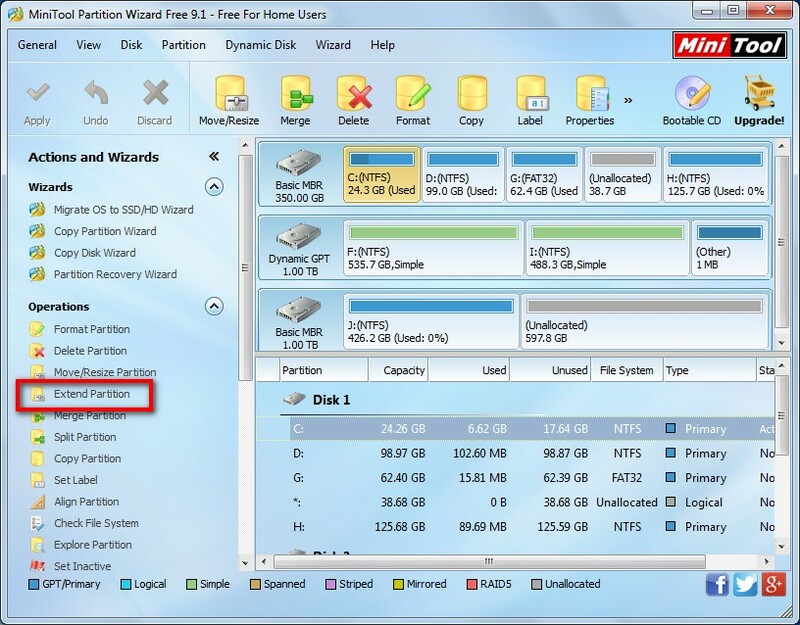 To enlarge a partition, just select the partition and choose "Extend Partition" function. Then, take free space from other partitions or unallocated space to extend. To combine 2 partitions, please select the partition you want to keep and choose "Merge Partition". Then, select the partition that will be included and click "Next". Tip: both partitions should be formatted with NTFS. If one of them is formatted with FAT32, please convert FAT32 to NTFS at first. At last, click "Apply" button to make the change performed. If you want to view or use files of the partition that is merged, please open the partition that is reserved and find the folder called merged_partition_content. Do you want to merge 2 partitions to one in Windows? Now, try one of our methods out.